To connect with people in Manhattan, the Seventh-day Adventist Church has established a center of influence called Life Hope Center Bryant Park. Sabbaths - 8 a.m., 5 p.m., and 8 p.m.
Wednesdays - 8 p.m. and 11 p.m. Many people find New York City an attractive tourist destination. But beyond the fine cuisine, upscale shopping, and entertainment, there are millions of people who call it home. To connect with people in Manhattan, the Seventh-day Adventist Church has established a center of influence called Life Hope Center Bryant Park. 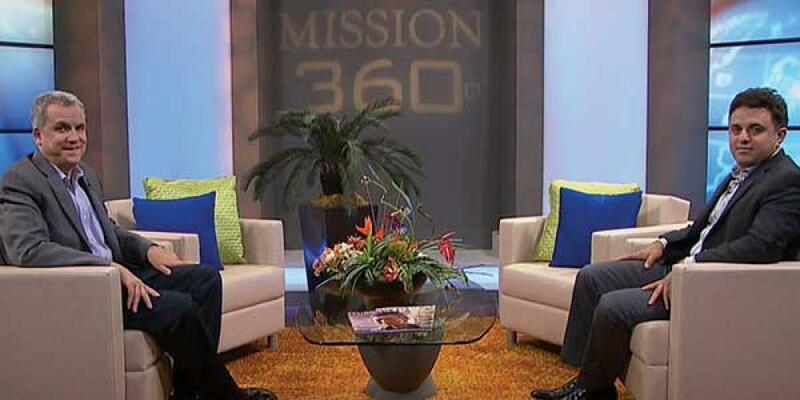 In this Mission 360° TV interview, center director, Pastor Bledi Leno, shares how they’re touching lives. Mission 360°: Bledi, thanks for joining Mission 360° today. What are Life Hope Centers and what is their ministry? BL: Life Hope Centers are centers of influence that are being established by our church all over the world. Their purpose is to connect with and meet the needs of people in urban communities. They offer a wholistic approach to physical, emotional, social, and spiritual development and often accomplish this through free seminars, resources, and services. M360: Tell us a little about Life Hope Center Bryant Park. BL: New York City is an exciting place to live. But the people here experience heartache and need God in their lives just like people anywhere else. Our ministry is fueled by love for people and love for God. We want the center to be an open door to people searching for a meaningful and life-changing experience. M360°: Where is your center located? BL: We’re in the midtown area of Manhattan, opposite the New York City library and Bryant Park, where thousands of people come to relax. And we’re just a couple blocks from Times Square, so we’re right in the heart of the city, where everything happens! It’s a great location because we get to connect with people from all walks of life and areas of the world. M360: So you’re using the center as a platform for ministry, where you mingle with people, show sympathy, minister to their needs, win their confidence, and lead them to Jesus. What are some of the first steps that you’ve taken? BL: We host a number of events at the center. One of our most exciting activities is what we call our lunch seminars. We provide a light lunch and a seminar on a topic such as healthy living, personal finance, spiritual growth, or family life. Another popular event is what we call our Happy Hour talks. We offer guests a healthy drink, a relaxing atmosphere so that they can unwind after work, and an interactive seminar. M360: It’s wonderful to see this building that has been owned by the Adventist Church for years being used for community outreach. Do you have plans to redesign it to make it more compatible for ministry? BL: Our goal is to create environments in which people can connect with each other. We want to open a vegetarian café and juice bar, establish a counseling center, and build multipurpose rooms so that we can host activities simultaneously, such as fitness and cooking classes. One of the building’s best assets is the view from its rooftop. We’d like to develop this space into a place for events. M360: We understand that you already have a small group meeting at the center on Sabbath afternoons. BL: Yes, we call it the Upper Room. It’s a church plant that focuses on meeting the needs of postmodern and secular people. We’ve been meeting for about a year now. M360: Tell me about someone whose life you’ve touched for Jesus. BL: I was able to connect with a young professional when she first came to one of our events. She was going through a rough time and she says the seminars addressed many of her needs. She’s been attending our church plant and has expressed a desire to be baptized. We’re planning a beautiful ceremony in the very near future! M360: That’s fantastic, Bledi! Thanks so much for sharing with us today. Originally from Albania, Pastor Bledi Leno pastored in Sao Paulo, Brazil for eight years. He is the director of the Life Hope Center in Manhattan, New York, and pastor of the New Jerusalem and Ridgewood Seventh-day Adventist churches and the Upper Room church plant. Audience, please remember Pastor Bledi Leno in your prayers as he touches lives for eternity in Manhattan. Mission to the Cities is the church's initiative to reach out to the world's largest cities. A vital part of that initiative is establishing Life Hope Centers, wholistic ministry centers that put Christ’s method of ministry into practice. Your Global Mission donations help support Life Hope Centers. To learn more about their ministry or to support their work, please visit MissionToTheCities.org. To discover how the Global Mission Urban Center can help you and your church connect with postmodern and secular people, please visit Urban.AdventistMission.org.